This is the largest version of the folding 'Jones' 'Common Flower or Insect' microscope. 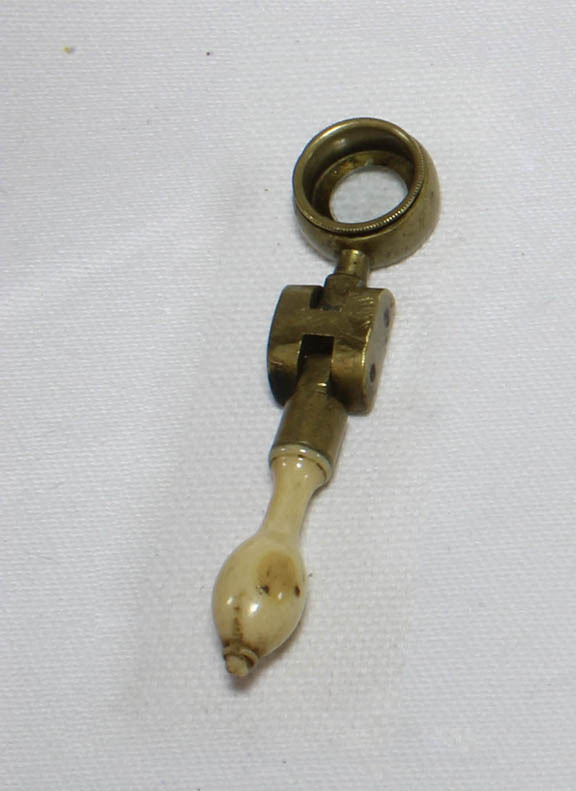 Like most, the lens and handle fold around the slot which projects out from the middle brass support. The piece projecting out from the main central brass part of the instrument has a slot and a springy piece of brass underneath. The specimen holder has a forceps on one side and a spike on the other. The support for this specimen holder slides on the sprung slot to allow focusing. The spring provides some tension to hold the forceps fitting in place. Tightening the knurled knob, which holds the specimen holder, tightens the grasp around it and also tightens it in the slot to fix its location once focused. This system was the standard for a hundred years. The instrument fits inside a red Morrocan leather-covered wood case with brown velour-lined bottom and a pink silky lining on the inside of the top. The length when fully unfolded from the tip of the handle to the top of the lens casing is about 102 mm. The distance from the outside edge of the main brass center to the end of the slotted piece is about 85 mm. The external dimensions of the box are 95 x 30 x 30 mm. The needle/forceps measures about 70 mm end to end. Note that, like the other two examples shown here, it has two lenses that can be removed so they can each be used singly or in combination, yielding three different powers. This is the usual or 'medium' size of what has been called a 'Jones' 'Flower or Insect' folding microscope. This model is smaller than the previous entry, but otherwise similar. 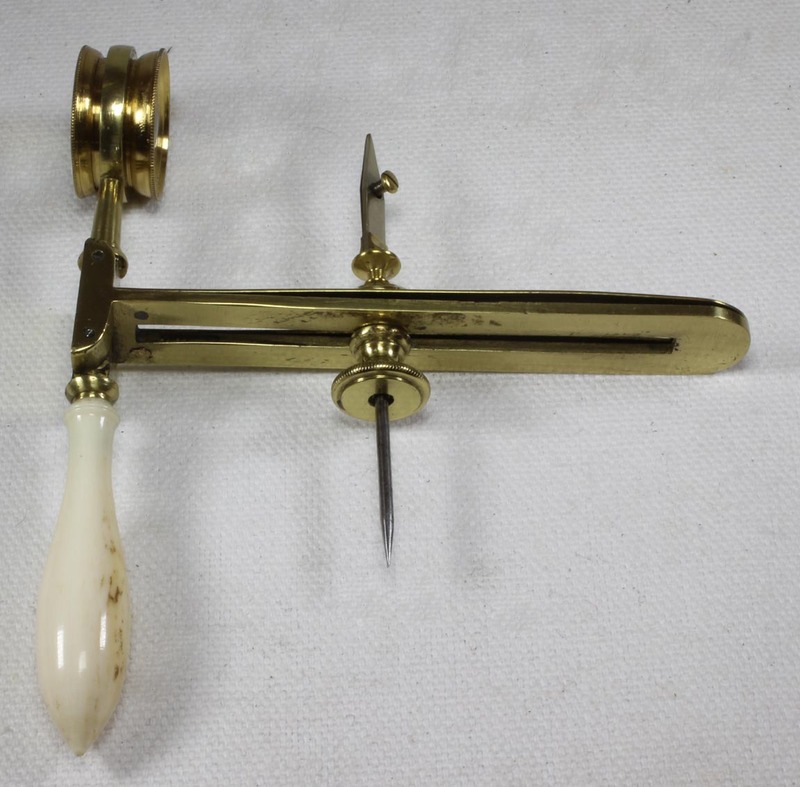 The smaller handle, instead being in a simple tapering shape has a few ornamental features as shown. The length when fully unfolded from the tip of the handle to the top of the lens casing is about 80 mm. The distance from the outside edge of the main brass center to the end of the slotted piece is about 56 mm. The needle/forceps measures about 50 mm end to end. This folding naturalist microscope is different than the preceding examples in that it is both smaller, and simpler. There is no support for a forceps, though the shape of the main brass centerpiece is similar in shape to the other two examples listed above. In this example, the length when fully unfolded from the tip of the handle to the top of the lens casing is about 62 mm. When folded, it is only 40 mm. To my knowledge, this is the smallest of these folding botanicals. I am aware of at least one other surviving example of this size without the slotted support, but it is still possible that the slotted support was originally present and then cut off by an owner or maker. This microscope has been referred to as a 'Botanical', 'Flower' (Adams and also much later, Queen), 'insect' microscope (Adams), or 'Entomological'(Giordano) microscope, depending on the author. The 1798 (2nd ed) of George Adams' 'Essays on the Microscope' illustrates this form for the first time and refers to it as the 'Common Flower or Insect Microscope. '1 By the time the second edition of Adams work was published, W. & S. Jones had taken over the business. 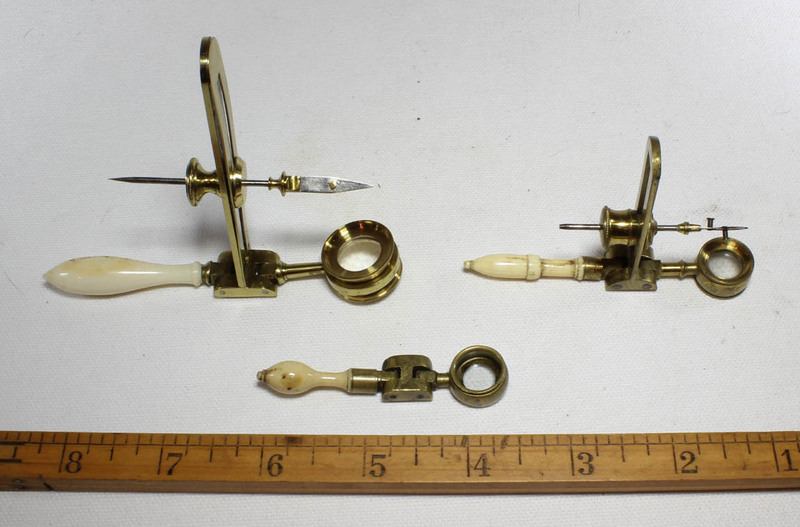 Small folding or non-folding naturalist's microscopes were very popular in the 18th and 19th centuries. 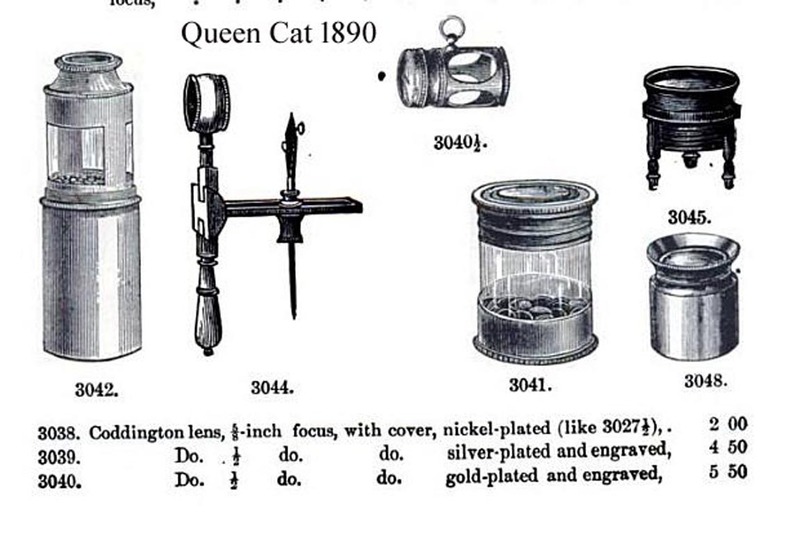 They ranged from simple hand-held magnifiers to portable free-standing microscopes like those invented by Withering. The Jones' sold instruments like these for many years. 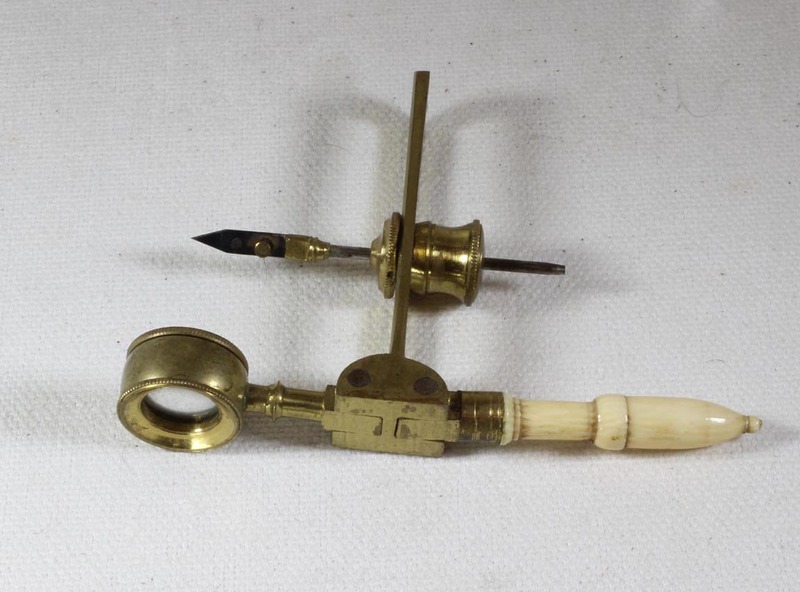 In fact, most nineteenth century instrument makers sold this type of microscope and it was still offered for sale as late as 1890 or even later. The picture shown to the right is from the 1890 version of the James. W. Queen catalog. Queen, of Philadelphia, was a prominent instrument seller even into the early 20th century. These instruments are often dated to the early 19th or late 18th century, but the truth is that they cannot be dated accurately except perhaps by the style of their case, or very rarely, a signature. Dating without an original case should generally simply be to the '19th century.' 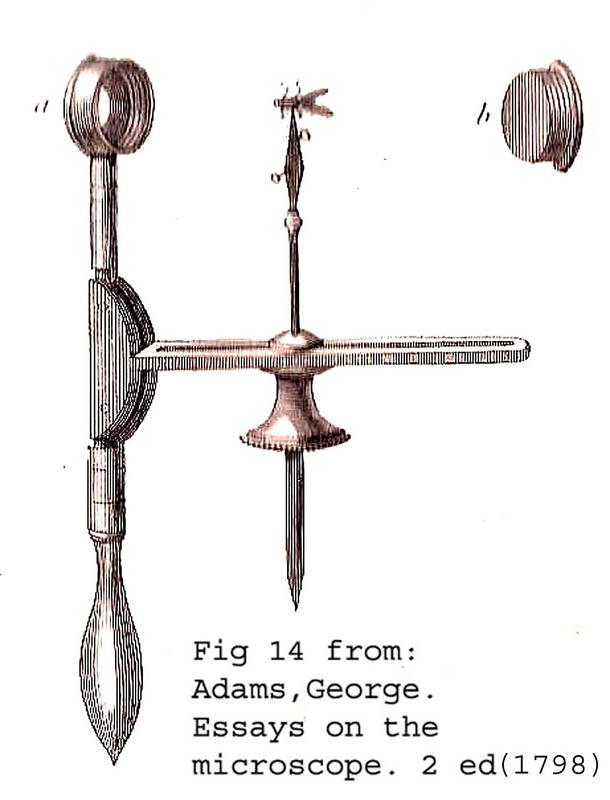 Likewise the inventor is open to question, as although first illustrated by Adams in 1787, neither Adams nor Jones seemed to take credit as inventors of the device. Since Adams used the term 'Common' to describe, one would assume it existed before his Second edition of the Essays was published. The author would like to thank Joe Zeligs for help with this page, including the citation of a footnote from the 'Editor' from Adams Essays on the Microscope. 1Essays on the Microscope by George Adams, 2nd edition, 1798, published by W. & S. Jones: Fig. 14 and the footnote by the 'Editor' on page 125.